to Heart gallery is updated!!! Hey guys! The lads' new single Ame No Melody/to Heart is out with 3 different covers! 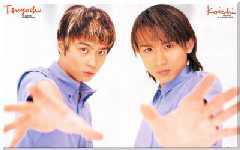 This KinKi Kids WEB RING site is owned by Kobo.